Plan to secure your own lodging for Friday, Sept. 27, in the picturesque seaside town of Oban before we embark the next morning on the final three legs of the journey to Iona. There are lovely hotel and B&B options in Oban to choose from, and we can provide suggestions if desired (lodging for this night is not part of the retreat package). After you have settled into your chosen lodging in Oban, we invite you to gather with us for dinner at the Lorne in the heart of the village to meet your fellow pilgrims. Your meal is included in your retreat package (all beverages are ‘no-host’). Your long journey to the sacred Isle of Iona is complete...but also just beginning. As you step onto the island’s ancient shore, Sally and Laurie will guide you to our lodging at Bishop's House. Here you will have time to settle into your rooms and enjoy the view of the sea (and maybe some neighborly Scottish Highland cattle) before we share our first evening meal at Bishop’s House. After dinner we will share introductions and an overview of our schedule for the week ahead. The New Moon will hold both our intentions for our time together in this sacred place and, if clear, an amazing star-filled night sky. Our first full day will be a less structured day of grounding ourselves and gaining a sense of the spaciousness of this remote and sacred locale as we orient to our new surroundings. Join others from the group for a stroll through the village or to a nearby beach, or take the day to simply rest and recover from the long journey to the island. Some may choose to attend one of several worship services available at Bishop's House and Iona Abbey. Sally and Laurie will offer guidance and suggestions for those eager to take in the landscape as we settle into our pilgrimage destination. The unique elements of Celtic spirituality will inform our day, as will the legacy of the Irish monastery that flourished on Iona for hundreds of years. 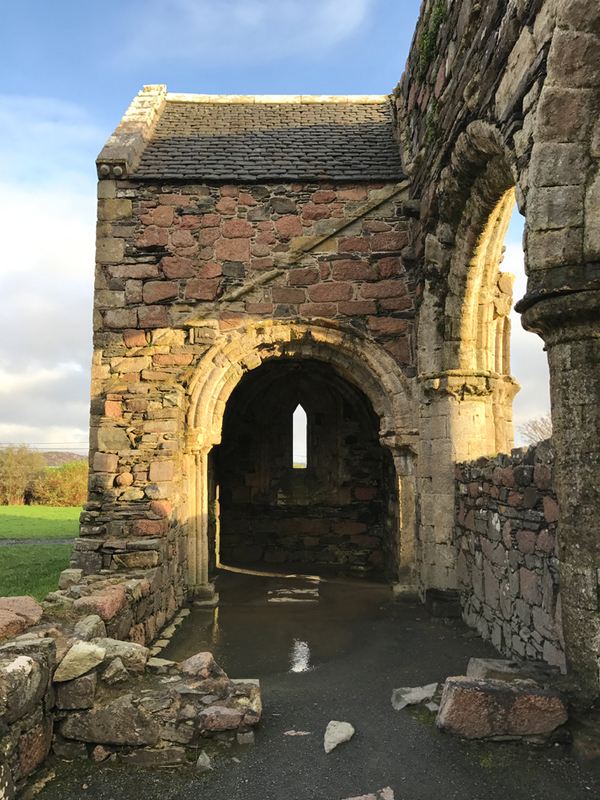 We will learn about the history of Iona Abbey and other sacred sites that reflect the ancient spiritual significance of this small island. A special beach at the north end of the island, known as the White Strand of the Monks, will be our walking destination, where spirit and nature are beautifully intertwined. 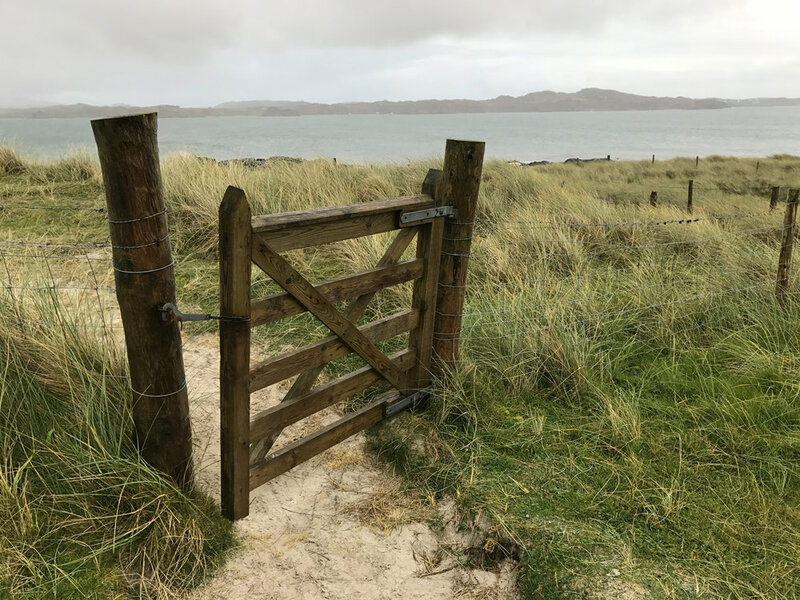 You will find your inner still-point as we explore the “thin space” of Iona (in Celtic lore, a thin space is where the veils between the seen and unseen world are more transparent). Weather permitting, a guided hike of the isle will give us a full day to immerse ourselves in the beauty of the landscape. We will learn more about the island's rich history as we visit St. Columba's Bay and walk in the footsteps of the Irish monks who first arrived on Iona's shores in 563 A.D. In the evening we will have the opportunity to attend the beautiful Iona Abbey for their weekly Prayer Service of Healing. To help us integrate that which we have experienced on our journey, SoulCollage® will guide us in using visual image as a portal to discovery. This simple, yet profound process honors the interplay between psychology, creativity and spirituality; no artistic talent is needed. Through collaging images onto 5x8” cards, the three I’s – Image, Intuition and Imagination – help us to call forth our own deep wisdom and unconscious knowing. Views of the sea, land, and sky of Iona will provide a beautiful backdrop for this soulful and contemplative process. Our final full day on the island, there will be time and space for you to revisit some of your Iona favorites. A silent stroll through the village will allow us to be mindful of images and sounds that engage our body, mind and spirit. With cameras in hand, we’ll be invited to ‘receive’ pictures that encourage us to see with the heart of a pilgrim. We will return in silence, take time to journal with our images, and share some of our reflections. A closing evening program in a special location will be a memorable ending to our time together as we prepare to leave in the morning. Our bags are packed, our hearts are full; a post-breakfast Celtic blessing will send us on our pilgrim journey home, or on to the next adventure! From the ferry we’ll wave goodbye to sacred Iona, until we next return.